I buy vintage linens at local estate auctions to pass them along to you. Recently I've found several antique women's hats. 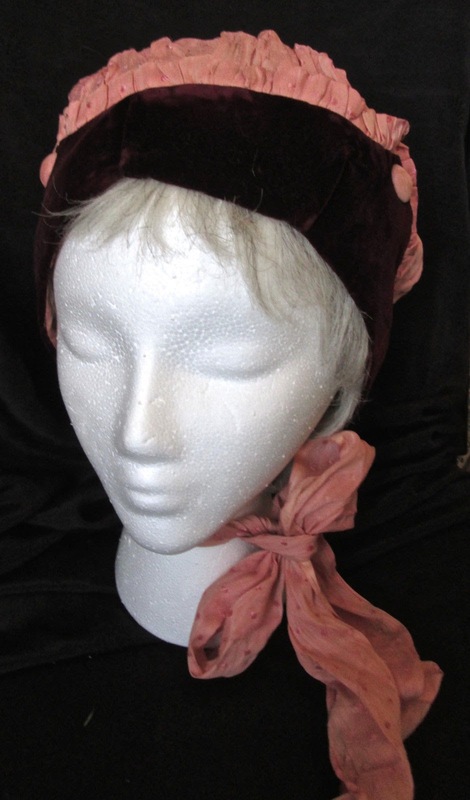 This is a bonnet-style women's hat from pre-1900. 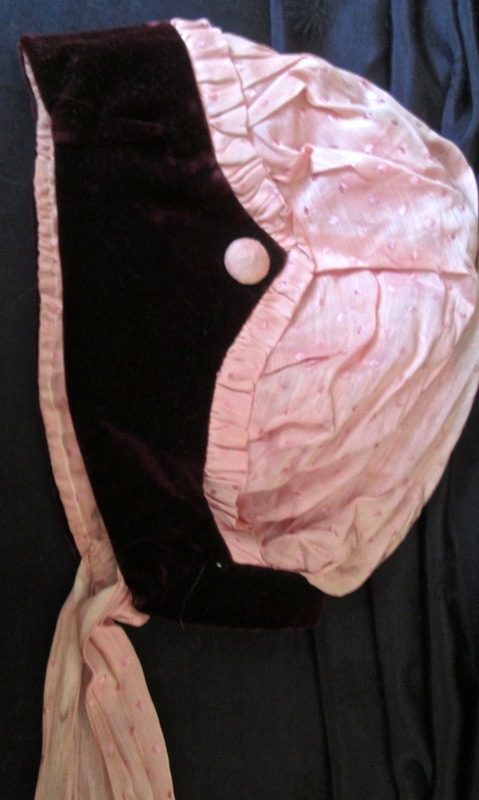 It has a crown of pink silk fabric that is woven with a diamond pattern and a contrasting band of dark burgundy velvet. The dark velvet band goes around the neck edge and the face edge, providing a wide brim-type band. 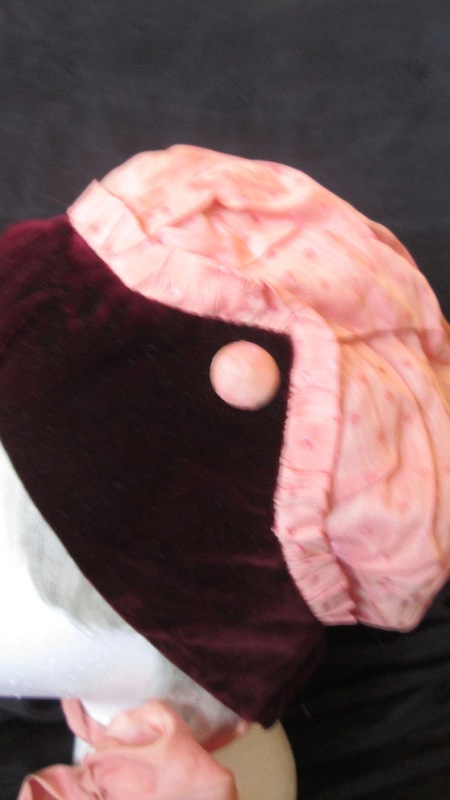 This velvet brim has two points, one on each side of the face at temple-height; these points each have a large button covered in the pink silk. 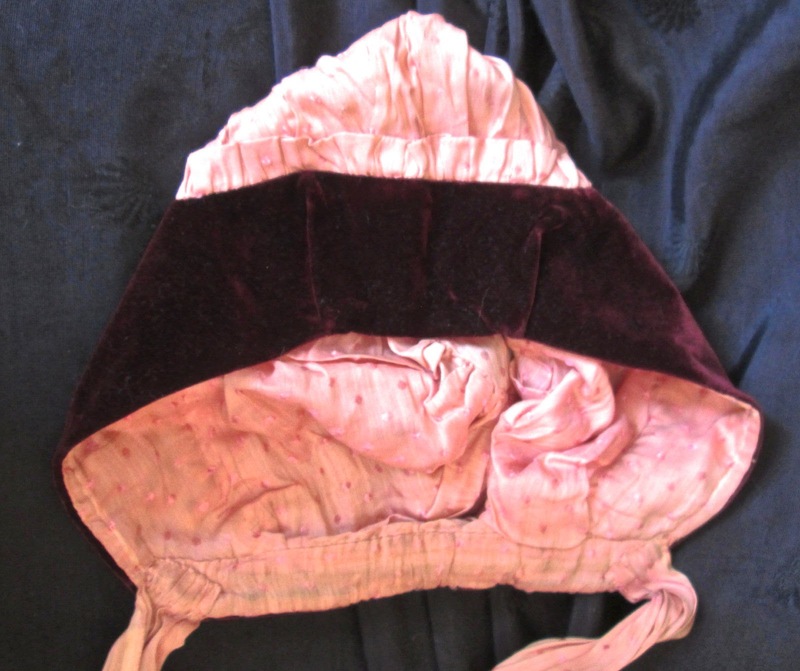 The brim is edged with a 0.5" ruffle of the pink silk all around the back edge, and the rest of the crown is gathered to form a puffed top. 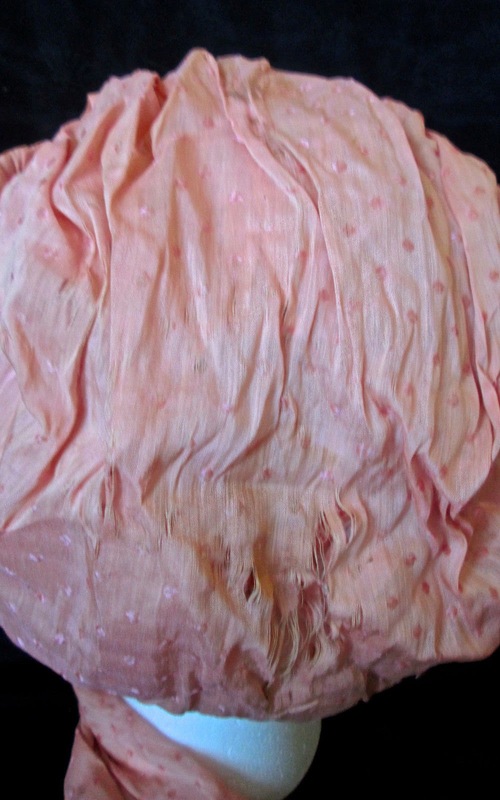 The inside is lined with the pink silk and finished with a circle in the back. There are long side ties of the same pink silk attached at each side, to tie under the chin. measurements: about 8.25" around neck edge; about 2.5" width of the velvet brim; about 19" around face edge; about 5.5" width of side from brim seam to back; about 4" width of ties; 23.5" length of ties. As to condition, it is a bit fragile. 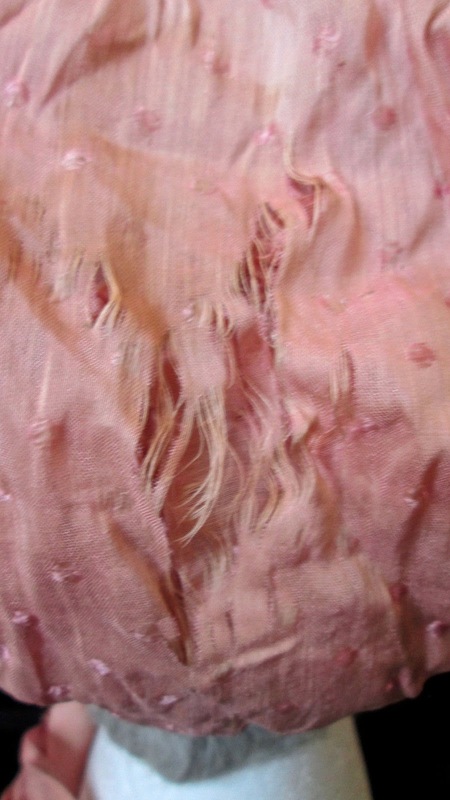 The velvet is in good condition, but the silk has begun to deteriorate. There is an area in the back of the crown with unraveling, as shown in the last photo. 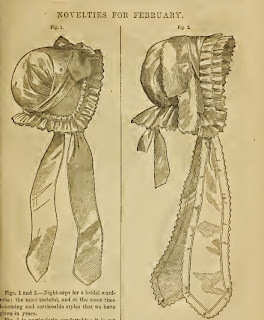 The ribbons are also quite worn, shown in the second-to-last photo. Even with this damage, this is an amazing survival, that such a delicate and pretty bonnet has come down to us. It will be wonderful for historical displays or costume collections. I am storing this in my smoke-free home, but I do have a cat who sheds copiously, so be aware if you have allergies. Please contact me for more information or photos. I am happy to combine items to save on shipping, so check my other listings too. Thanks for looking! I mainly got it because it confused the heck out of me and I wanted a closer look. 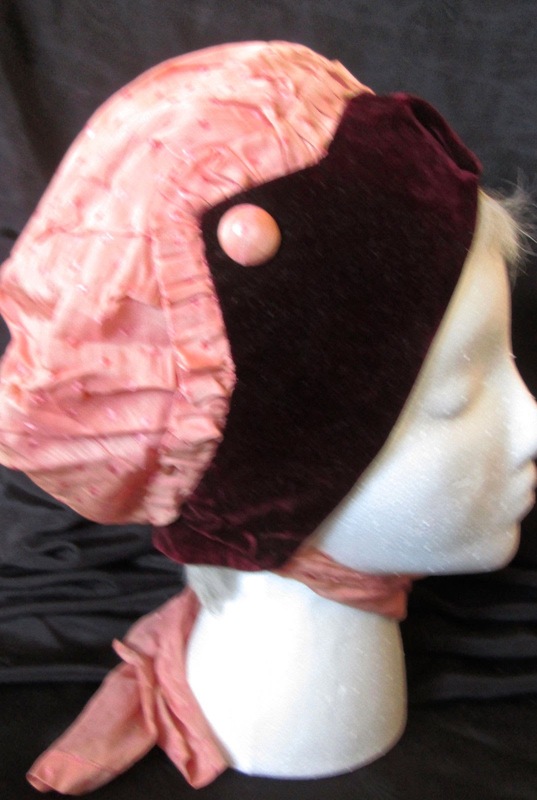 Was it one of those super crazy Regency hats or was it something far more modern, ie, 1930's? Turns out, it looks to be neither - it's most likely from the 1860's. Inside the velvet brim, there is a line of white machine stitching. The rest of the cap is handsewn. The fabric is clearly old when you see it up close. Based solely on the color combo, I thought it might be 1890's. Well, that, and the silk has polka dots. 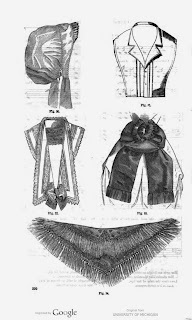 However, the cut and style of this nightcap is very similar to various ones in fashion magazines from the 1860's. Although those are normally either netted or out of lawn, there are some claims of nightcaps out of silk at the same time. There is the one above from Godey's magazine. v.86-87 1873. However there is also this one from 1861 which looks more like the extant cap. The lines of this one - down to the odd triangular cut right at the ear and the width of the ribbon- are very similar the pink silk nightcap. However, since the cut of a nightcap didn't change much for a couple of generations, it could easily be later than the 1860's. Cool! Congratulations on your score!